Each basic attack increases SAW's attack speed by 25% and armor & shield by 1, but it also decreases his move speed by 0.12 (up to 12 stacks). SAW sprints & switches to a melee combat knife. 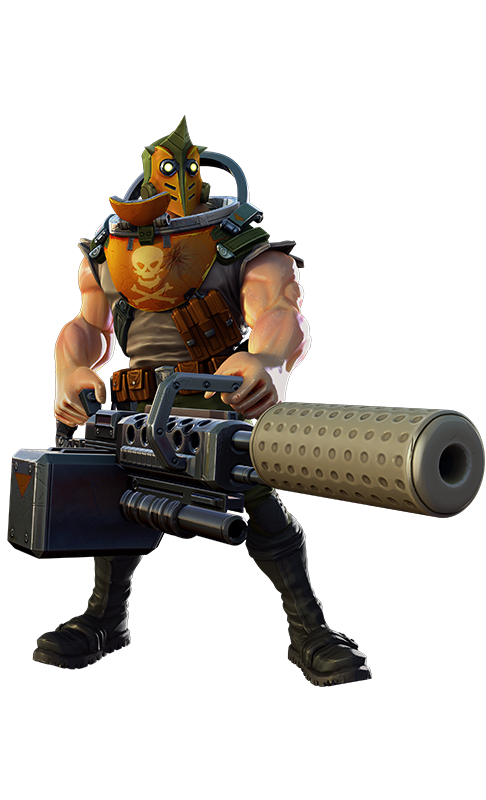 If SAW attacks someone, he will deal bonus damage based on the target's missing health & roll backwards. Activating this ability clears all stacks of Spin Up. Crystal will boost the speed, up to a maximum of +2. 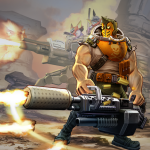 SAW fires a hurricane of bullets in a set direction for 2.5 seconds, damaging and slowing enemies in its path. Activating this ability grants all stacks of Spin Up. Deal 1/3 damage to turrets. SAW loads explosive shells into his gun which deal additional damage based on the target's missing health. The shells also deal splash damage based on the amount of crystal power SAW has. This explosive ammo fires 36% slower and grants 2 stacks of Spin Up. The original dream for SAW was the big guy with the big gun. The logical conclusion was to make this skin the ultimate cyborg — but the fun part is, this isn’t really SAW. It’s a robot sent to take SAW out and replace him. I created certain angles and facets on SAWborg’s shapes so the light would catch it. I wanted him to read well even though the character is small on screen. I had fun putting multiple barrels on the gun to show the spin up. And of course, he keeps his trademark rhino horn. 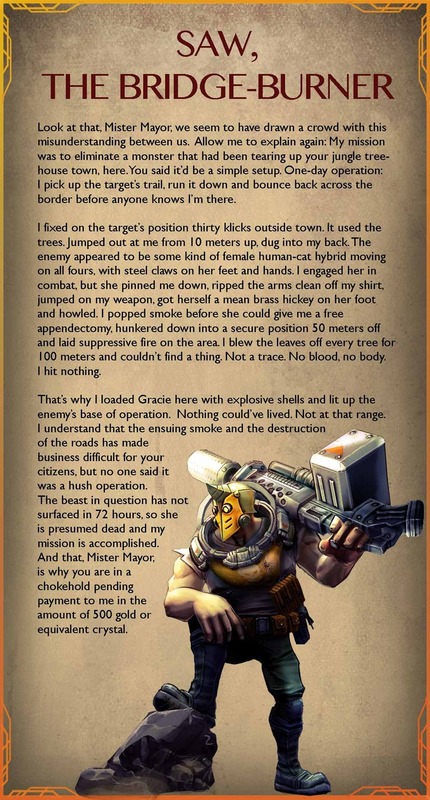 For more SAW lore, tap the links below this story! To read Part I, tap here. To read Part I, click or tap here. SAW can’t get to the gym much, but that doesn’t mean the training stops. 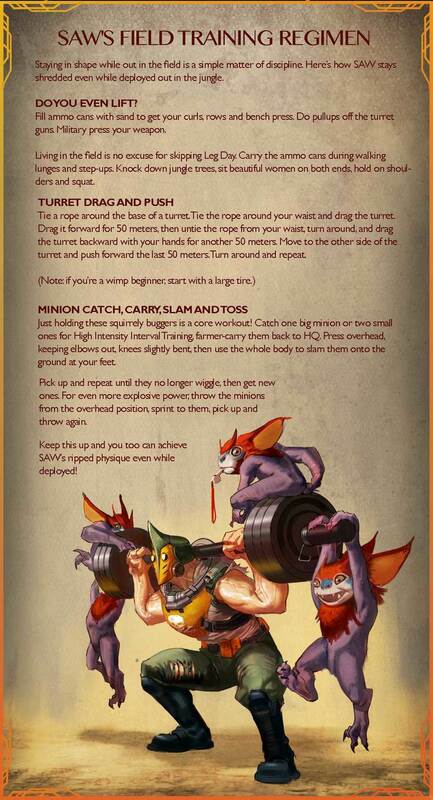 Read about his field workout routine, but don’t attempt without proper minion supervision!